Happy equinox, Garlic Gold® Fans! We’ve made you a big, beautiful omelet featuring our favorite seasonal ingredient: green garlic. Tender garlic shoots emerge from the ground each spring, and are only in produce markets for a short time — call ahead to make sure your local grocer or farmer’s market is carrying them this week. 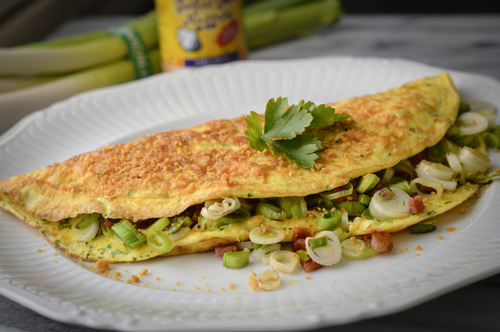 Green garlic is sauteed with bacon to make a delicious, savory filling for this big, fluffy 3-egg omelet. Serve it with whole-grain toast for a weekend breakfast — it’s generously sized to feed two regular appetites, or one very big one! We top our omelet with Garlic Gold® Nuggets for an extra crunchy topping that ties in with the fresh green garlic filling. It’s a wonderful combination of flavors you can only get this time of year. Heat a nonstick skillet over a medium flame. Add the diced bacon and sauté until some of the fat has rendered but the bacon is still soft, about three minutes. Add the green garlic to the skillet, toss with bacon, and sauté until bacon is fully cooked and the green onions have softened and become a bit translucent. Set the mixture aside, making sure to leave a bit of the bacon fat in the pan. In a medium mixing bowl, vigorously whisk the eggs and salt until fully beaten and a bit frothy. Pour into the heated skillet, agitating with a spatula to create some large curds. When the omelet is mostly set but still a bit wet on top, pour the green garlic and bacon filling onto one half of the omelet. Transfer the omelet onto a serving plate, folding it over as you slide it out of the pan. 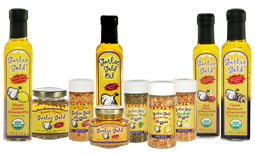 Sprinkle generously with Garlic Gold® Nuggets and serve hot.